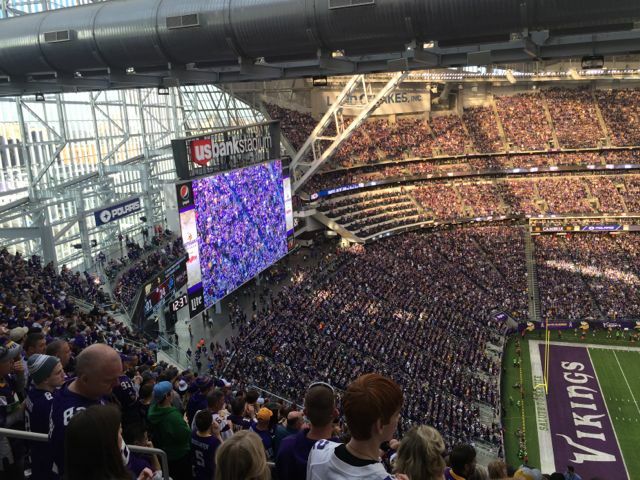 The trend of fans continuing to use more and more wireless data at big sporting events shows no sign of slowing down, especially after Verizon Wireless said that it’s already seeing more cellular traffic at Vikings home games this year than it saw at Super Bowl 51. Verizon, which built the neutral-host distributed antenna system (DAS) for cellular carriers at U.S. Bank Stadium in Minneapolis, also said it increased the DAS antenna count by 48 percent at the venue this past offseason, in order to better support the expected surge coming at Super Bowl 52 on Feb. 4, 2018. At a press event at the stadium today, Verizon said it now has approximately 1,200 DAS antennas of its own at U.S. Bank Stadium. “We’re very confident” that both the DAS and Verizon’s networks will be more than ready to handle the Super Bowl when it comes to Minneapolis at the end of this current NFL season, said Diana Scudder, executive director for network assurance at Verizon, in a phone interview earlier this week. 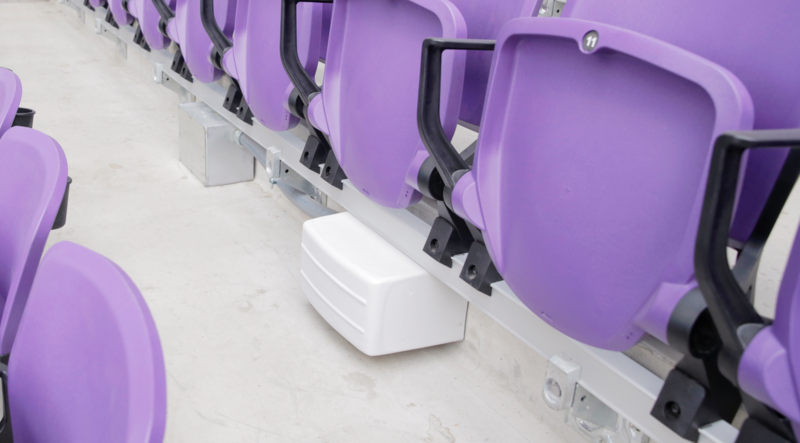 Though the stadium opened in 2016 with a fully functional DAS, Scudder said Verizon spent the past offseason adding more capacity for its customers with additional DAS antennas in a variety of deployment methods, including antennas in enclosures both under-seat and in handrails, as well as in pole-mounted deployments along standing-room drink railings in both end zone concourses. 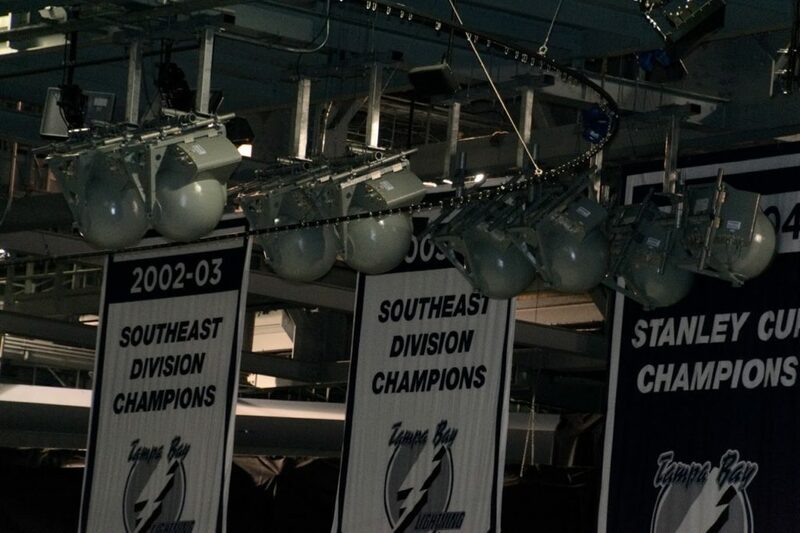 Though Scudder declined to say exactly how many DAS antennas there are in the building, with the new “48 percent” additional antennas Verizon said it now has 100 DAS zones throughout the venue, including the seating bowl, concourses, suites, and outdoor DAS coverage surrounding the stadium. But perhaps the most surprising reveal was that in-stadium DAS traffic at Vikings home games this season have already produced single-game numbers that Scudder said were greater than those seen inside the stadium at Super Bowl 51, held Feb. 5 at NRG Stadium in Houston. 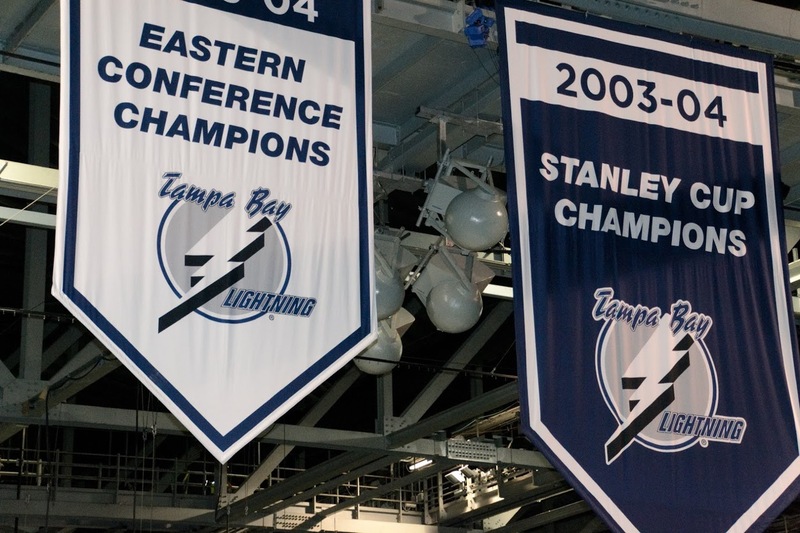 Pay attention here, because the italicized distinction is important. Given Verizon’s historic coyness on numbers, it’s no surprise that Scudder did not provide an exact number for the Vikings in-stadium DAS traffic that she said surpassed Super Bowl 51’s mark. She also didn’t disclose what the in-stadium only DAS number was for Verizon at NRG Stadium. The only reported Verizon number for DAS traffic at Super Bowl 51, 11 terabytes of traffic, includes data not just from the stadium, but also from macro network connections within a 2-mile radius of the stadium on game day, Scudder said. So far, Verizon hasn’t provided a Vikings regular-season game-day measurement for traffic outside the stadium as well. So if it’s not an apples-to-apples comparison yet, if the in-stadium marks are already higher, the bet is that whatever total number Verizon sees at Super Bowl LII, it will be greater than the 11 TB seen at Super Bowl LI. 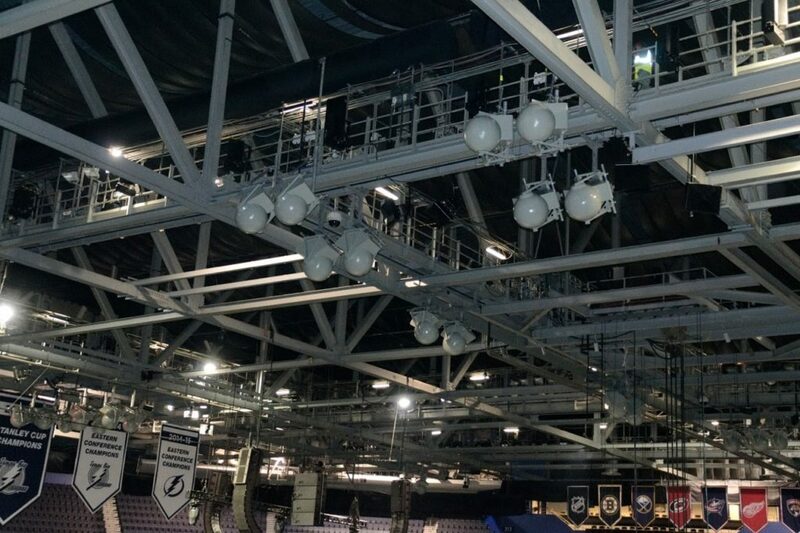 It’s also not surprising that the DAS installation at U.S. Bank Stadium is already looking like it will surpass NRG Stadium’s marks, simply because with the advantage of greenfield construction, all networks at U.S. Bank Stadium were designed with some of the latest deployment knowledge available. 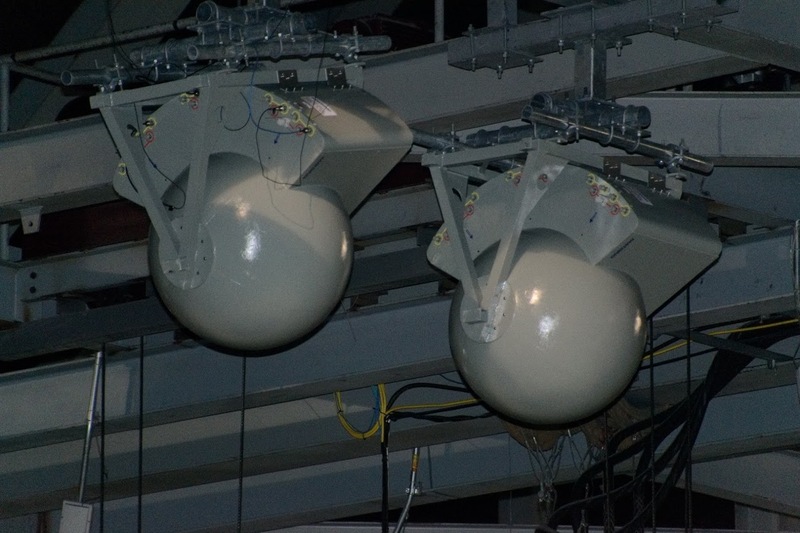 At NRG Stadium, where networks were added well after construction, Verizon deployed DAS antennas under the concrete floors, an easier deployment method but one that typically produces lower throughput than other methods. And for Super Bowl 50 at Levi’s Stadium in Santa Clara, Calif., Verizon added under-seat DAS antennas in what was believed to be the first such deployment for cellular DAS. 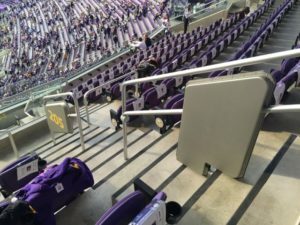 AmpThink, which built the Wi-Fi network in U.S. Bank Stadium relying on handrail-mounted AP enclosures, seems to have played a hand in part of Verizon’s DAS upgrade, as some of the new DAS enclosures seem to mimic the Wi-Fi ones. Scudder did say that Verizon used contractors to assist with the new antenna deployment enclosures and mounts, but did not cite AmpThink by name. The new under-seat DAS deployments and the handrail DAS deployments are Verizon-specific, meaning they are not part of the neutral host DAS that provides service for other cellular carriers. In addition to overhead DAS antennas mounted pretty much everywhere it would make sense — below overhangs, and even in twin-antenna mounts on poles hanging down over concourse walkways — there are now a series of DAS antennas mounted on poles just above the main-concourse end-zone standing areas, where fans can lean against drink rails while watching the game. In a pregame test on Nov. 19 for a Vikings home game against the Los Angeles Rams, MSR tests saw DAS speeds of 77.35 Mpbs download and 32.40 Mbps upload on one of the end-zone concourse areas. 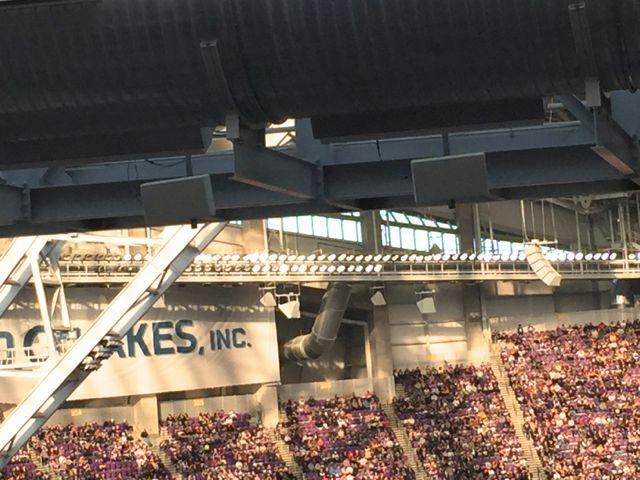 Even up in the most nosebleed of seats — in U.S. Bank Stadium’s case, section 345, which has seats almost touching the roof in the southwest corner, we got a DAS speedtest on the Verizon network of 60.87 Mbps / 44.22 Mbps, most likely from some antennas we could see mounted just above the seats on ventilation pipes a bit toward the field. 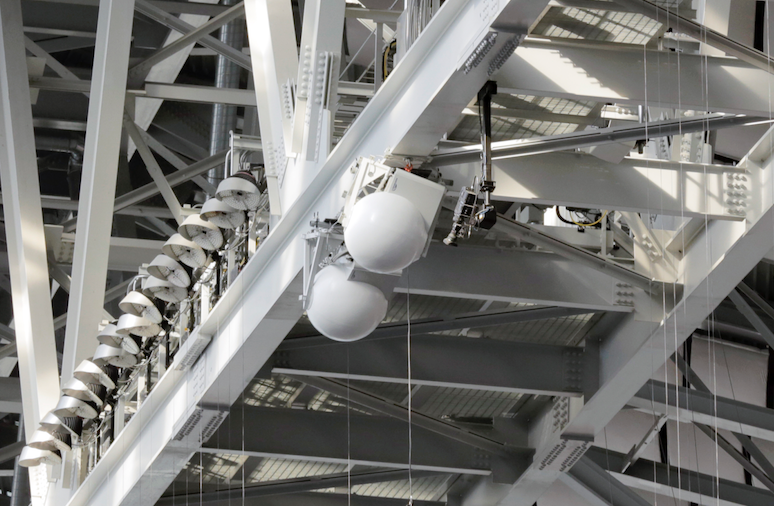 And hanging from the middle of U.S. Bank Stadium’s roof are a pair of Matsing Ball antennas, which point down to provide cellular service for media and photographers on the sidelines, as well as for floor seating for concerts and other events. 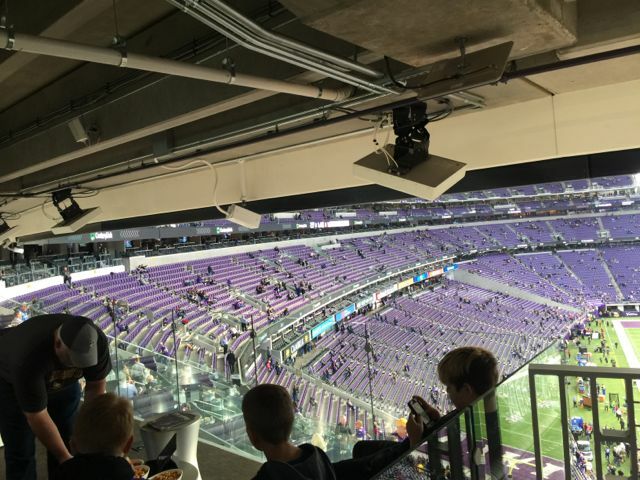 According to Scudder, any and all antennas are all needed, both for Vikings home games at the 66,200-seat venue, but also for the Super Bowl, where additional seating will host more fans, media and other attendees for the NFL’s championship game. “The consumer appetite [for wireless data] is insatiable,” Scudder said, noting that these days Verizon pretty much plans to see double whatever the last Super Bowl saw for each following big game. 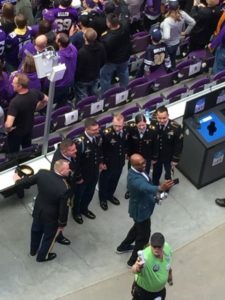 Verizon’s deployments don’t end at U.S. Bank Stadium’s walls, either. According to Scudder over the past 2 years Verizon engineers have been busy adding capacity all over Minneapolis, including in downtown areas, at the Minneapolis airport, and at the nearby Mall of America. “We’ve been partnering with the Twin Cities for 2 years now and they are very receptive and want to have the latest technology here,” Scudder said. 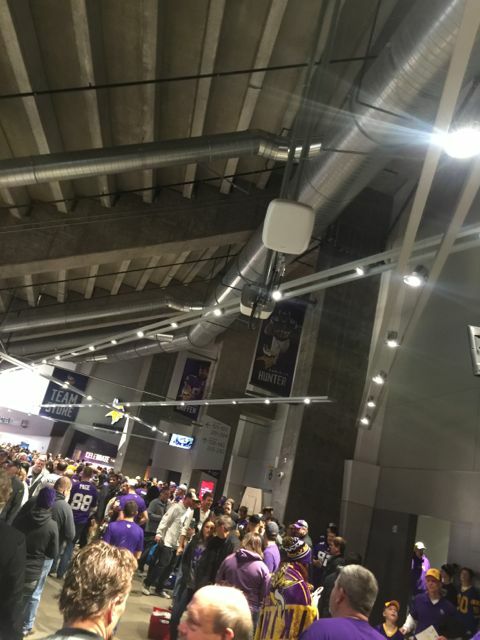 Scudder also said that all the improvements, in DAS, small cell deployments and macro towers, will remain as permanent solutions, helping keep Minneapolis a Super-connected city even after the big game is over.